Some of you have been waiting for this for years, cursing, complaining, being sarcastic or otherwise criticizing as the months go by. 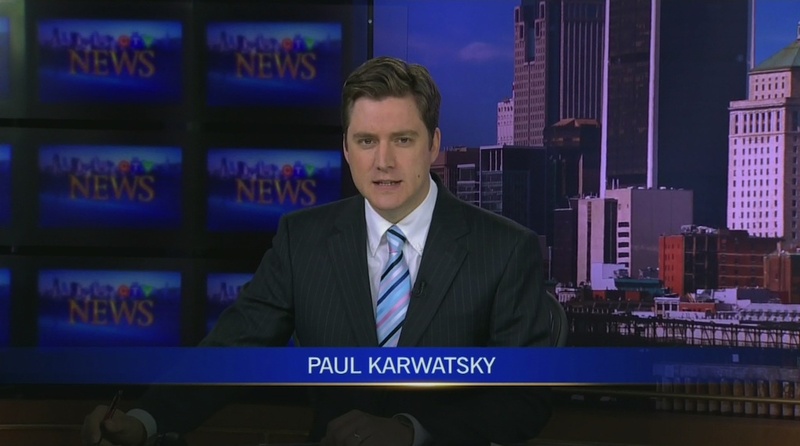 On Monday, CTV Montreal’s newscasts finally switch to high definition. The station has spent the past few months converting the last piece of its big puzzle, the control room, to high definition. In fact, the transition has required the creation of a second control room as the first one has continued operating. Studio cameras, field cameras and editing suites have been in HD for quite some time, requiring an awkward HD-to-SD conversion, which goes back to HD for air. The final switches will happen over the weekend, which means the weekend newscasts will move to the newsroom, the same place they were done from in the summer of 2011 when the station rebuilt its studios. Among the changes happening over the weekend, a wall being moved about two feet to make room for a wider (16:9) chroma key wall used for weather. Monday’s noon newscast will be the first in HD. CTV Montreal has been slower than its competitors to make the transition. Publicly and privately, people in charge have admitted that there’s little competitive pressure to make the very expensive switch. Even with black bars beside a squarish image, CTV Montreal far outdoes competing newscasts from CBC and Global in the ratings. Montreal is about the middle of the pack for CTV in the transition in major markets. Toronto, Edmonton, Calgary and Vancouver have already switched. The new control room will be run by OverDrive, an automated control room system by Canadian company Ross Video. The new automation will reduce the number of people needed in the control room, though CTV Montreal is keeping a lot of control in human hands. Five jobs will be lost when the transition to the automated system is complete. All five, says Operations Manager Dave Maynard, are voluntary retirees. They include CTV Montreal union local president Doug Kelly. “To get that point took a helluva lot of work, but the end result is that we have a positive, even enthusiastic work environment that welcomes this automation system,” Maynard said. The automation system will be phased in, starting with the late-night newscast. A week later, the noon newscast will be produced with OverDrive. The 6pm newscast will switch to the automation system on June 22. The transition will be of personal significance for Maynard. He won’t be directing under the OverDrive system, and is giving up his director’s seat in the control room in order to focus full-time on his job as operations manager for the station. His last newscast as a director will be at 6pm on June 21. “I will hang up my director’s hat (or socks) and never tell another joke into Mits’ earpiece ever again,” he said. Don’t worry. He still has her email address. When is the cocktail party ? is finally coming to an end. So it’s about time Ctv and congratulations . . . They would have done it sooner, but some of the equipment is in a 5 ton truck doing a live field deal right now. Finally, it’s been a long time coming. I have been watching CBC Montreal News since they switched to HD a few years ago. I will continue watching CBC from 5-6 pm then switch to CTV from 6-7 staring Monday to compare the two HD feeds. Not sure when all shows and/or channels will finally switch from SD to HD. I would have thought that by 2013 the roll-out of HD would had been fully implemented. I have my HD TV for the past 6 years and the transition seems to be taking a lot longer compared to the switch from B&W to Color. I have been watching CBC Montreal News since they switched to HD a few years ago. CBC Montreal’s newscast hasn’t actually been in high definition that long. They had it in 16:9 standard definition for a while before finally switching over. Most shows are in HD now. It’s hard to think of one that’s not. It depends how you define things. The transition from black and white to colour took a while too, from the mid-60s when colour televisions were widely available to the early 70s when the last programs switched to colour. Most programs in TV are at least created in HD, but converting local television stations takes a lot of money and effort, which must be weighed against the benefits of HD. No doubt other stations will follow in the transition in the years to come, with only the smallest ones remaining in standard definition after a while. You have to remember however that the transition here was simplified by the fact that the standards overlapped – which is to say you could use a B&W tv to watch a color signal without any loss, and the new color sets could show the black and white signals perfectly as well. Stations could switch to color without any issue without having to wait for consumers to catch up. The real problem of the digital changeover was that it was delayed endlessly, in part to give those consumers a chance to catch up. By the time TV stations even started to covert in any big numbers, many consumers already had their sets. So now the consumers have a great new TV, and crappy old low def programming. Of course they aren’t thrilled. In Canada, it’s made worse by the fact that we were 3-5 years behind the US at all steps, including the final one. While the major Canadian networks are still getting up to speed (and Bell might be done with it’s conversions in 2015 or 2016), there isn’t really any US affiliate stations left on standard def. It’s appalling that Canada would be that far behind. So the transition from B&W to color really isn’t a good comparison, because the digital process was not naturally parallel. It had to be forced, and that gave cheapskate companies like Bell the chance to avoid upgrading their equipment any faster than they have to. Remember, the only reason CFCF turned on a digital transmitter was basically to get sim-sub on the superbowl a couple of years back. Otherwise, they would have waited until the last day too. It was getting a little embarrassing that a large market newscast was still in SD until now when you consider that even WPTZ & WCAX have had HD newscasts for some time…so it’s about time! WPTZ & WCAX have had HD newscasts for some time…so it’s about time! Last I checked, WPTZ’s newscasts were not yet in high definition, just 16:9 SD. Forgot about HD, where are the reporters? Montreal, a city of 4 million, has not one live anglo media person/reporter/monkey working overnight. This means if our water is tainted or there is a bomb or a fire or any other emergency, there is NO ONE awake to report it. Equally ridiculous, is the fact that the anglo outlets all have spiffy websites but no one updates them when the sun goes down. The whole purpose to having a net presence is to be able to provide and change info quickly. I am embarrassed by Montreal’s anglo media! Enough with automated nothings overnight! Start reporting. They’re missing 50% of the news and putting us in danger. Montreal, a city of 4 million, has not one live anglo media person/reporter/monkey working overnight. Actually, the local TV stations usually have a cameraman working overnight to cover fires, crime and other events that happen overnight. This means if our water is tainted or there is a bomb or a fire or any other emergency, there is NO ONE awake to report it. This is true, though given a large enough emergency people will quickly start. Equally ridiculous, is the fact that the anglo outlets all have spiffy websites but no one updates them when the sun goes down. You noticed that too, huh? They’ll usually at least keep someone late when there’s a Canadiens game, but yes, the TV stations’ websites don’t stay updated 24/7. The Gazette’s website is staffed at least from 7am to midnight every day. The whole purpose to having a net presence is to be able to provide and change info quickly. There are plenty of purposes to having a website. I don’t know if yours is the primary one. They’re missing 50% of the news and putting us in danger. Can you provide a concrete example of how you’ve been put “in danger” because a TV station’s website wasn’t updated overnight? My concrete example would be another tainted water scare. Having no one local and breathing on air at any of the anglo media outlets and no one breathing and updating at one of their computer keyboards, means that this city may go a full 12 hours or 8 hours without being informed of the emergency. Same goes for serious storms, of which we have had a few. Regardless of how you look at it, having no live beings on air or in the newsroom past midnight is shameful. My concrete example would be another tainted water scare. So your “concrete example” is a fictional one? Maybe we should wait for something to happen before assigning blame for it. Regardless of how you look at it, having no live beings on air or in the newsroom past midnight is shameful. I’m certainly not going to defend the practice of newsrooms shutting down overnight (especially newsrooms of 24-hour news channels). But the reality is that very little news happens between midnight and 6am, and even if it did most of the population is asleep so they won’t hear about it until morning anyway. This is like CJAD having nobody report on the between midnight report and 4:30 when Andrew Peplowski does his first report…I suspect this will change once TTP Media gets going at AM 600. I really can’t wait what ‘AD will do. I wonder if they will also tinker from 6 to noon..One of those two has got to go..Mr.Carter or preferably Mr. Schnurmacher. Tommy might fit in well at the Surburban and their brand of anglo angst..
That would be the sort of competition that Bell doesn’t want. Remember this: If Bell owns CTV, CFCF, CJAD, and so on, they will have the stranglehold on Montreal news. Do you honestly think they will actually make any real moves face to the almost non-existent competition? Unless TTP sudddenly gets 10% market share, you can be sure nothing will happen to improve montreal news. Remember this: If Bell owns CTV, CFCF, CJAD, and so on, they will have the stranglehold on Montreal news. There are legitimate concerns about Bell owning both CTV and CJAD, and I’ve brought them up before. But it’s silly to suggest that Bell would have a “stranglehold” on news in a market with six daily newspapers it doesn’t own, plus all sorts of different electronic media. TTP and your promised 24/7 coverage, where are you, we need you..!! Often the satellite and microwave trucks are not ready to transmit HD signals. Are the CFCF transmission vehicles ready to transmit HD signals? Perhaps CFCF are using Dejero’s to transmit back to the mother ship? Are the CFCF transmission vehicles ready to transmit HD signals? Perhaps CFCF are using Dejero’s to transmit back to the mother ship? The station says it will upgrade at least one of its two trucks. They’ve also tried the Dejero boxes, but those have reliability issues because of their use of the wireless network. They tried them for Charbonneau Commission live hits, but then switched to a hard line. Dejero’s is a great tool. Network congestion can have issues on getting a signal though in movie rush hour. A solution seems to be a bigger array of cell SIM cards. Good luck to all at ‘CF. I heard CTV Montreal is now in HD,what channel is on with Bell TV? Looked on the guide was not able to find it for some reason. Depends whether you’re on satellite or Fibe. If you’re on Fibe, and in the Montreal viewing area, it’s channel 1201. Satellite, last I checked, was 1031. Speaking of CTV in HD, did you go to their Fall Launch invite at the old Windsor Hotel, where there usually hold it, and if so, did they have their usual groovy live entertainment before they show the upcoming fall shows.. Yes, but it was actually at the Scotiabank theatre downtown. They rented out a couple of cinemas for the night. did they have their usual groovy live entertainment before they show the upcoming fall shows..
I’m not sure what qualifies as “groovy live entertainment” – they had food, and the CTV News personalities to mingle with. “live entertainment” probably not at the theatre, meaning a band, sone local singer with musicians..e.g. One year they had Nikki Yanofsky. The entertainment might do maybe a 15-20 minute set after welcome remarks and before they show the fall shows.. So some singing while people are on the finger foods and cocktails. Wonder why they switched, The Windsor was perfect. So who had the fancier event, CTV or Rogers last week.?? As if it matters, they were both pretty similar: cocktails and mingling, followed by a screening and speeches in a theatre, followed by more mingling. CTV gets bonus points for having more food and for organizing a private screening of the new Superman movie. But I’m guessing what the advertisers really care about are the ratings, and CTV clearly has the edge there. I actually watched ctv montreal news noon on Monday…. that new control room system was not all it could be. Damn! Didn’t take me TOO long to notice the switch to HD. I must have gotten hypnotized by the length of time I waited. Some of the ads are still 4:3, but I assume that’s their choice. In any case, Pulse is now in HD, and I’m lovin’ it.